john4jack (Corvallis, Oregon, United States) on 2 September 2009 in Architecture and Portfolio. 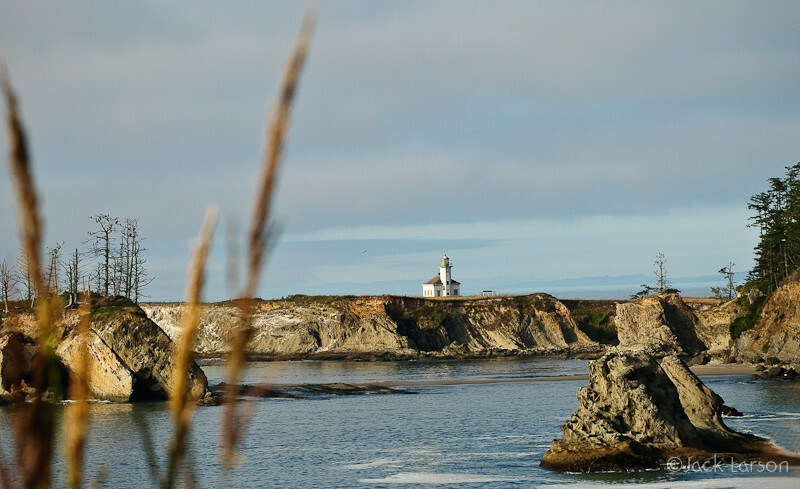 Looking out at the Cape Arago Lighthouse across the bay had a mystical feeling for me. NEW MACBOOK PRO arrived yesterday. Everything migrated without a hitch. Most seems to be working well. onOne's Plug-in Suite 4.5 has required being deactivated from my old computer. Am still in the process of getting it sorted out. Did a nighttime calibration. Will do the primary calibration tomorrow. A wonderful view, wonderful photo! Very nice compostion and warm colors. Have a nice day Jack ! Superb light! I like the golden hues of evening or morning! I recognize this building from afar! @Mathilde Collot: Thanks. It was late afternoon. Nice, love how the textures of the rock were captured. Beautiful composition, with nice light and a good DOF. A Humdinger of a shot. Just love it...my shot of the day today! A beautiful composition ,I like the colors too! beautiful view ! I like the light and the colors ! Great shot . Beautiful scene ! I like this scene, very nice warm tones. A fine lighthouse shot. You show the rugged terrain nearby very well. Well done. A beautiful composition, nicely framed... I can say all that... but all I want to talk about is the view only. That's what kept my eyes staring at it for quite some time. @Ajay: Thanks, Ajay. That's why I call it "mystical." Nice place with the cliffs - great composition ! la lumière est merveilleuse, posée sur le phare comme un projecteur.. c'est excellent Jack. It IS mystical....and very peaceful and lovely. You've captured this (and all the Oregon images) so well that I am thinking I am going to have to take a trip up the Oregon coast this fall. Thanks for the inspiration. A very nice landscape shot ! Inviting, for sure, and a grand image. At first I wasn't sure about the foreground branches, however they do add depth. A very interesting landscape mix in this shot. The lighthouse almost looks like it just "landed" there. So beautiful and clear picture! Well done! @susan: They are quite intentionally in there. nice perspective. I especially like the bokeh in the foreground because it gives a greater sense of the depth of the image. the lighthouse seems so far away, right at the edge of the earth. Mystical photo of a beautiful location. An interesting capture where the size of the lighthouse really emphasizes the height of the towering cliffs. Nicely composed shot,lots of layers going on.Very good work. In there somewhere in this magnificent photo, is me. I love this Jack! Isn't that a beautiful scene? Great shot. The texture and light of the terrain is what captivates me. The image gives the impression the lighthouse is out of reach and appropriately titled, mystical. The grasses in the left side of the frame give a unique addition to the image that I am more comfortable with rather than uncomfortable. Very nice. @Barbara: Thanks, Barb. It was a lovely setting on a lovely late afternoon. Wonderful light! We visited this lighthouse during the bright part of the day, so I didn't shoot it...But I am glad you got such a wonderful shot! a very beautiful area -- nicely captured, love this even light!